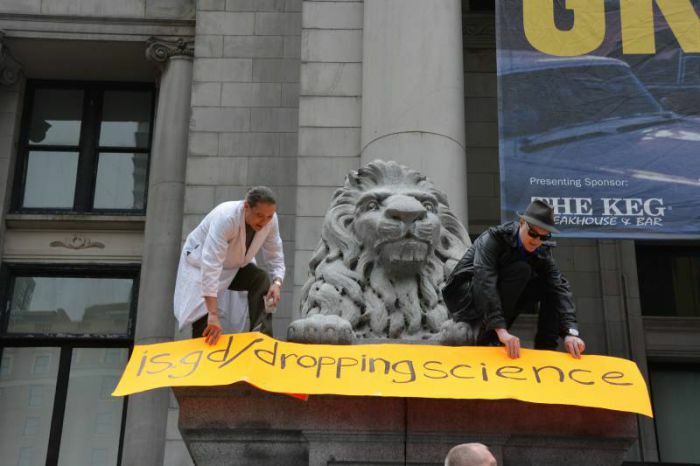 At the Stand Up for Science Rally in Vancouver yesterday I had to wonder why Tzeporah Berman was speaking. Unless shilling for Campbell’s Lieberal Party and the Stolen Land Olympics is a science, she’s not a scientist. Unless selling out rainforests and their Indigenous and settler defenders alike is a science, she’s not a scientist. And even though I still have some lingering respect for Dr. Suzuki, and am occasionally cheered by some of the things he has to say about the lunacy of allowing corporations to lead the charge to save the planet they’ve nearly destroyed, I have to wonder how he can allow the foundation that bears his name to take money from “defense” contractors / drone manufacturers, Honeywell and its chair to double dip as a consultant for Royal Dutch Shell (really). Though I was actually there to assist in the setup of this event, I’d consider my betrayal here minor compared to theirs. After being more than a little suspicious of these outfits for some time I now firmly believe the ENGOs are nothing more than left-gatekeepers for capitalism and the Indian Act chiefs of the environmental movement. And so I dropped some science on how and why the environmental, settler-ally “left” is losing. After volunteering for too many muti-million dollar budget, enemy-funded foundations over the years, I think I’m finally cured. The articles at this link have to do with the anti-democratic ENGOs, this week’s betrayal of the environment and member unions by the BCFED, and the sponsoring of Truth and Reconciliation ™ in Vancouver next week by pipeline companies. I believe these stories epitomize what is wrong with “our” movements. The Tzep was just on Democracy Now, maybe someone can alert Amy Goodman to her more nefarious things, though she loves the McKib too!